The OTL 2.0 is not yet ready but I’ve decided to pre-announce some features. They are, after all, available to all programmers following the SVN trunk. 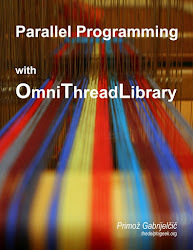 While the focus of the OTL 1 was to provide programmers with simple to use multithreading primitives, OTL 2 focuses mostly on the higher-level topics like parallel for and futures. Parallel.ForEach was introduced in release 1.05 but that version was purely “technical preview” – a simple “let’s see if this can be done at all” implementation. In the last few months, Parallel.ForEach backend was completely redesigned which allowed the frontend (the API) to be vastly improved. The basic ForEach(from, to: integer) has not changed much. The only difference is that the parameter type of the Execute delegate is now “integer” and not “TOmniValue”. If you have data in a container that supports enumeration (with one limitation – enumerator must be implemented as a class, not as an interface or a record) then you can enumerate over it in parallel. The new ForEach backend allows parallel loops to be executed asynchronously. In the code sample below, the parallel loop tests numbers for primeness and adds primes to a TOmniBlockingCollection queue. A normal for loop, executing in parallel with the parallel loop, reads numbers from this queue and displays them on the screen. While this shows two powerful functions (NoWait and OnStop) it is also kind of complicated and definitely not a code I would want to write too many times. That’s why OmniThreadLibrary also provides a syntactic sugar in a way of the Into function. Secondly, because Into is called, ForEach will automatically call CompleteAdding on the parameter passed to the Into when the loop completes. No need for the ugly OnStop call. Thirdly, Execute (also because of the Into) takes a delegate with a different signature. Instead of a standard ForEach signature procedure (const value: T) you have to provide it with a procedure (const value: integer; var res: TOmniValue). If the output parameter (res) is set to any value inside this delegate, it will be added to the Into queue and if it is not modified inside the deletage, it will not be added to the Into queue. Basically, the parallel loop body is replaced with the code below and this code calls your own delegate (loopBody). The last two versions are used to iterate over any object that supports class-based enumerators. Sadly, this feature is only available in Delphi 2010 because it uses extended RTTI to access the enumerator and its methods. The backend allows for efficient parallel enumeration even when the enumeration source is not threadsafe. You can be assured that the data passed to the ForEach will be accessed only from one thread at the same time (although this will not always be the same thread). Only in special occasions, when backend knows that the source is threadsafe (for example when IOmniValueEnumerator is passed to the ForEach), the data will be accessed from multiple threads at the same time. I’m planning to write an article of the parallel for implementation but it will have to wait until the PreserveOrder is implemented. At the moment backend implementation is not fixed yet. I use OTL very often. Hi, I it possible to use OTL v 1.x with C++ Builder 2007? I so are there any limitations? @macma77: Sorry, I have no idea.